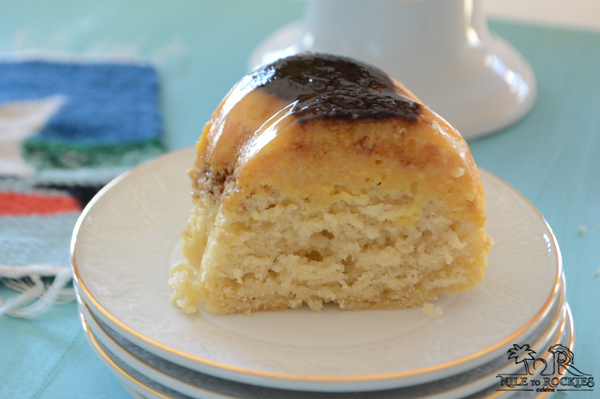 A dreamy moist and sweet cake in 3 milk syrup, that was a real surprise for me as I am not a milk enthusiast. 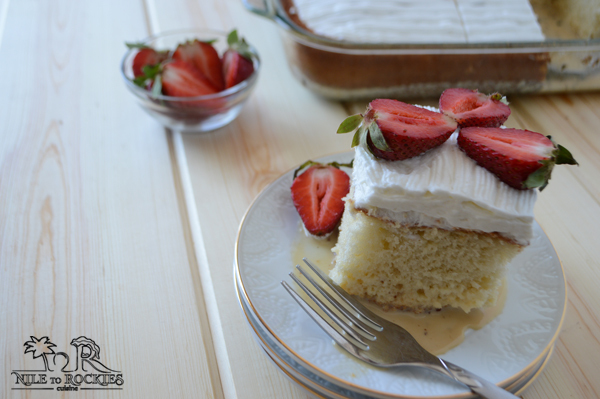 Tres leches, OMG , it took me a week or more to figure out what my kids are talking about!!. Let me start from the beginning. My kids attend an immersion international school, the last Friday of each month, they have an international day, where they introduce the kids to one of the countries around the world. They usually have a speaker who is originally from this country to represent the culture, religion, and all aspects of life. Guest speakers really do a great job, they bring artifacts, clothes, food and all sort of things related to that county’s culture. I remember when it was the Egyptian day, I took my crock pot packed full with ful medammes and I bought tortilla chips instead of pita chips – for gluten allergy purposes – got a ton of things from home and friends, we took many pictures of kids wearing Egyptian clothes .. it was super fun and my kids were popular at school, and of course I was the best mom ever. They were really proud of their mom. When it was Mexico day, OMG, it was like a carnival there, lots of dresses and sombreros, and many many delicious food. Kids came back thrilled about Mexico and what they had seen and also what they have eaten. They have had many goodies that they kept describing all sorts of food and they mentioned a sweet cake that tasted magical but they forgot the name. 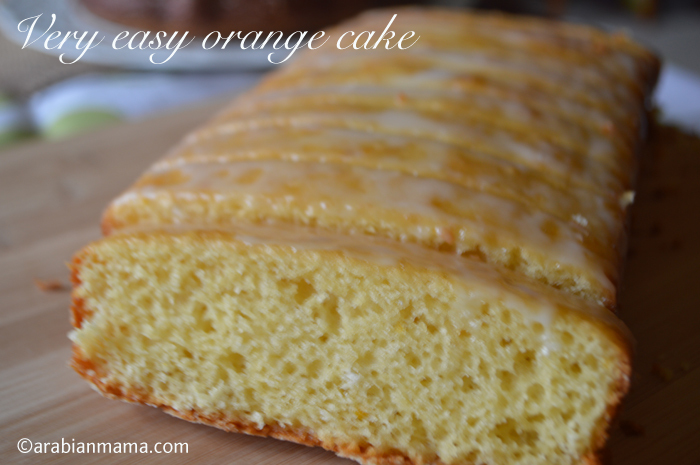 It is fluffy, sweet with white stuff that is somehow looks like a cake you’ve made before! !, honestly I did not have a clue. Being curious, I went to google and tried to pull out some pictures showing it to the kids and trying to get some feedback… Until I finally figured it out, I’ve decided to make it and ask them if it is this one or not. When I made it, they were thrilled. They get excited whenever they see whipping cream on top of anything :), it is like a feast for them. One of them say that’s it, the other- 5 years old- was not sure, but they all gulped it happily and of course again, I was the best mom EVER. 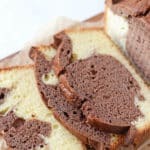 This cake is absolutely genius, the three milk syrup is heavenly good, cake is moist and stayed moist until it was gone. 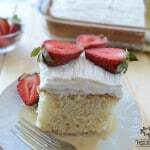 To make life easier for me- as I had a tight schedule- I’ve used vanilla cake mix, but when I have more time I’ll make sure to make my own, so you can use your most trusted sponge cake or go the easy way as I did. The cake turned out very delicious and everyone loved it. Next time, I’ll make sure to attend these international days at my kids’ school, food is really a great way to discover cultures. 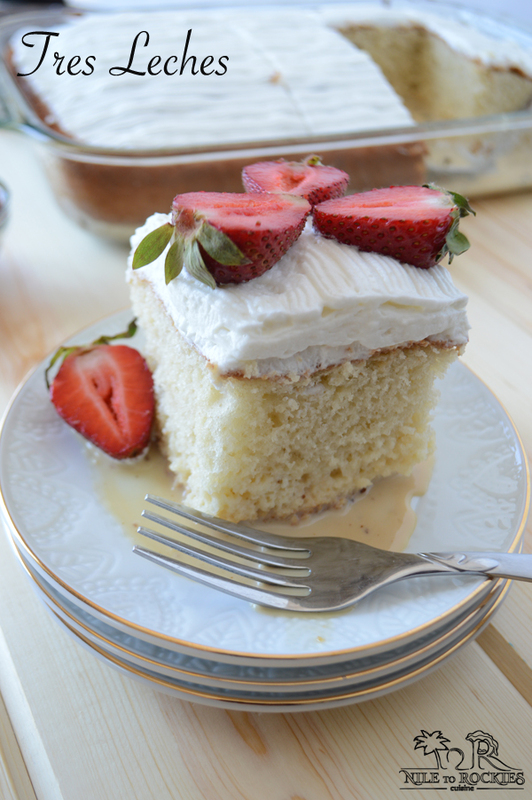 * 1 box of vanilla/yellow cake mix. Make the cake as directed by the package. Here we mixed the cake mix with the eggs, oil and water until well incorporated. Grease a 9x13 oven dish, then pour cake mixture. Let it cool completely for almost 60 minutes. Meanwhile, mix the milk syrup by adding the three types of milk in a bowl and mix well. 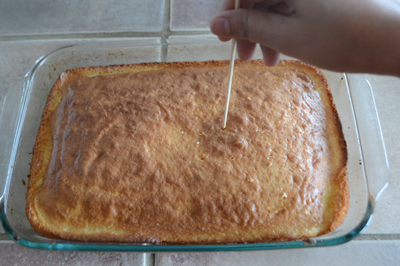 Poke the cake with fork or bamboo skewer several times to help the cake soak the syrup. 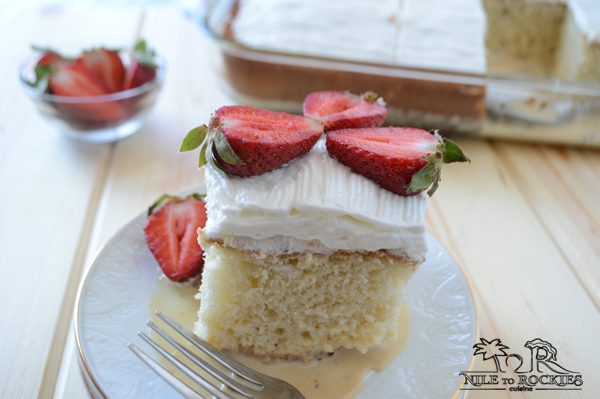 Pour the syrup over the cake and wait for about 10 minutes until it no visible milk on top of the cake. 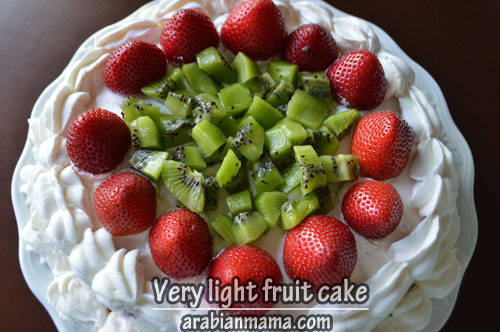 Prepare whipping cream, and decorate your cake. Serve with some fresh fruits. 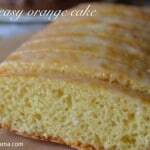 * You can also make your favorite sponge cake recipe. What an excellent idea!!! 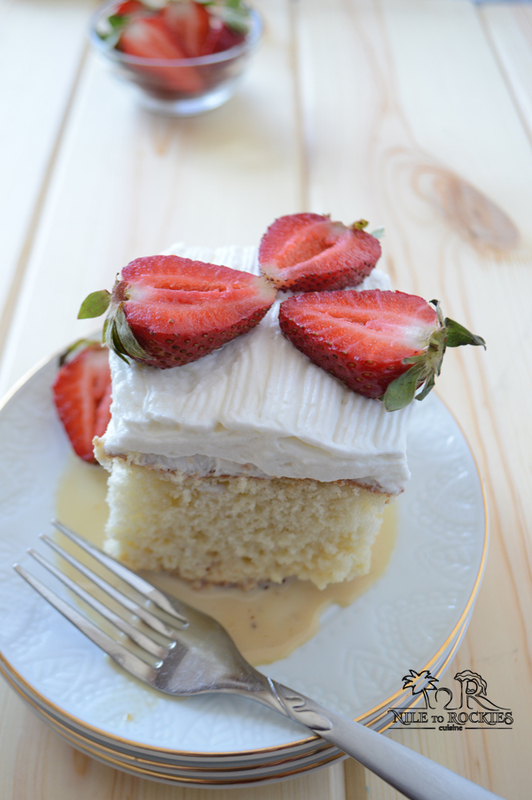 The milk syrup was so new to me and that’s why I was very much interested in the flavor it will lend to the cake.